← Blog news! I want to work for you. Ridley has gone through an extended period of poor results and restructuring, and those efforts are finally showing fruit. A number of unprofitable facilities have been closed, and margins are on the rise after bottoming in 2012. What’s more, the company’s crown jewel division has continued to grow and is achieving record revenues and profits. The company’s stock price has rallied, but not enough to fully price in these improvements. First, a little background. The beef business has been tough for the last several years. Ongoing drought conditions have caused US beef production to decline to levels not seen for decades. As of January 2013 the total US cattle population was 89.3 million, according to the National Agricultural Statistics Service. This is the lowest since 1952. Conditions are similar in Canada. From 2003 to 2013, the Canadian cattle population fell 9%. Falling cattle populations lead to a sharp decline in profitability for Ridley. From 2007 to 2012, gross margins declined from 16.36% to 11.60%. Revenues rose in absolute terms, but not enough to withstand the effects of the shrinking gross margins. Despite falling gross margins, Ridley was able to maintain its operating margin through aggressive cost cutting and shutting down unprofitable locations. Here are five year figures for the company, unadjusted for one-time charges. Figures are in USD. Subsequent to the end of fiscal 2012, Ridley has taken additional steps to improve profitability. Ridley’s Canadian feed operations struggled in 2012 and 2011, operating at just over or under breakeven each year. In December 2012, Ridley combined its Canadian feed operations with Masterfeeds, Inc. creating Masterfeeds LP. Ridley owns a minority stake in the surviving business. The business combination freed up significant capital and has already resulted in improved operations. For the first four months after the merger, Ridley’s share of operating income from Masterfeeds LP has been $0.5 million, compared to losses in 2012. If Masterfeeds LP’s results continue apace, Ridley will realize $1.5 million in income from associates this year, a nice uptick from 2012’s loss. Ridley also acquired Stockade Brands, a maker of feeding blocks and nutritional minerals for livestock and equines. Stockade Brands is consolidated with Ridley Block Operations, Ridley’s block and nutritional mineral producer. In case you’re wondering, a cattle block looks a lot like this and contains a substance that cows will like to lick, ingesting beneficial nutrients in the process. 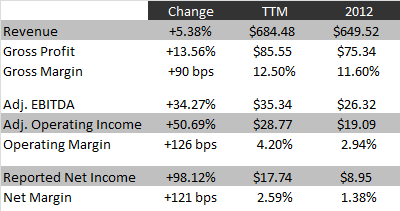 The result of these moves has been an uptick in profitability and income. Ridley has reported three quarters of operations since 2012. For the twelve trailing months ended March 31, 2013, Ridley’s operating performance has improved greatly over fiscal 2012. These results include only four months of Masterfeeds LP and Stockade brands results. When fiscal 2013 results are released, I expect to see material increases in all categories over 2012 and over the twelve trailing months through Q3 2013. While even better operating results are on the horizon, Ridley looks cheap on its current results. Ridley’s market cap in USD is $147.14 million. The company has small amounts of cash and debt on the books, making its enterprise value essentially the same as its market capitalization. 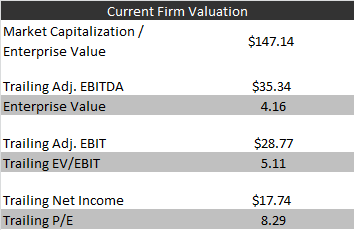 4.16x EBITDA and 5.11x EBIT are very reasonable prices to pay for a recovering business that has not yet reached its full earnings potential. Alternatively, Ridley can be viewed as a sum of the parts story. Ridley’s operations are divided into four segments: US Feed Operations, Masterfeeds LP, Ridley Feed Ingredients and Ridley Block Operations. These four divisions vary widely in terms of growth and profitability and would be given divergent valuations if they were standalone companies. Though it is not the largest division in terms of revenues, the star of the show is Ridley Block Operations. Since 2007, the division has growth its revenues at 7.6% annually and its operating income at 17.9% annually. Block Operations actually benefits from drought, because cows require more nutritional supplements in very dry weather. In reality, Ridley Block Operations’ results have been even better. Until 2012, the company included its McCauley Bros. equine feed business with Ridley Block Operations; that business is now included in the Ridley Feed Ingredients segment. A business with RBO’s growth and operating leverage is clearly worth a healthy multiple. Even if that multiple is only 8x trailing operating income, RBO is worth $145.68 million, or essentially Ridley’s entire current market cap. But Ridley’s other businesses certainly have worth as well. Ridley Feed Ingredients averaged $3.35 million in operating income on steady revenues from 2010 to 2012. At a 6x multiple, it’s worth $20.10 million. The US Feed Operations segment has only two years of information available, but for 2012 and 2011 it averaged $3.90 million in operating income. Revenues at US Feed Operations have been volatile. At a 5x multiple, the division is worth $19.50 million. Masterfeeds LP has limited history, so a conservative multiple is warranted. At 4x its projected $1.50 million in operating income, it is worth $6.00 million. Again, these valuations are very conservative. They don’t account for the cost cutting Ridley has undergone, nor do they anticipate a rebound in the cattle industry. Summing up the values of Ridley’s segments yields a value estimate much higher than Ridley’s current market cap. If and when the US and Canada beef industries do turn around, the values of these segments could rocket higher. The USDA projects herd numbers will recover by 2018, based on expected declines in corn prices and an easing of drought conditions. Even if a recovery in the cattle industry is delayed, investors can still benefit from the improvement in Ridley’s operations. If these improvements can be maintained, the market will eventually re-rate the company to a more reasonable valuation, probably at least 1 or 2 turns of EBITDA and EBIT higher than now. Investors may also benefit from Ridley’s habit of paying special dividends, $3.50 per share in the last two years alone. Remember that Ridley is controlled by Fairfax, which will want a financial return on its investment. Ridley has little debt and could easily pay another substantial dividend through a combination of operating cash flow and modest borrowings. Risks for Ridley include a return to the trend of lower and lower gross margins, which could necessitate additional restructuring costs. A resurgence of “Mad Cow Disease” would also deal the company a blow. Tax policy is an unknown factor. Presently, the company owes taxes on transfers from its US subsidiary to the parent company. As an aside, how do you buy an OTC share ? Will your regular broker buy one for you ? Forgive my ignorance, I am new to US equity markets. You can buy unlisted stocks using practically any discount or full-service broker. Orders are entered just like any other. Just be patient. Order fulfillment can be much, much slower than with listed securities, especially if you set a limit price below the ask. Thanks for the idea. People might also want to look at the ‘parent’ company, Ridley in Australia. There’s a June 2013 yearend presentation on their website but no financial statements yet. It looks like a marginally profitable company with a fairly reasonably priced cash flow. They sold almost all of their evaporative salt operations last year and now have a net cash position. For someone who knows something about Australian real estate it might be interesting because they retained many of their salt pond landholdings which might be worth a lot. The best ones are about 2,000 bayfront acres bracketing the town of Geelong, just west of Adelaide, and there are others. The presentation implies that Ridley wants to develop these landholdings and not sell them outright. With a stock market value of about A$ 250 million, values of over $ 20,000 per acre on these former salt ponds might make this a really cheap stock. But someone would have to know about Australian real estate. Good suggestion. I took a superficial look at Ridley Australia when I was researching Ridley Canada and decided it was a bit too complex for my tastes at the moment. But yes, somebody with a good understanding of the Australian property market might be able to evaluate the company’s landholdings. Hi – nice write up. I was wondering if you knew how long Fairfax has been an investor and what their history is with the company? Why havent they bid for the whole company at this point? Fairfax bought a 69% stake in Ridley, Inc. in September, 2008. Prior to that, the 69% stake was owned by an Australian company, Ridley Corp. I imagine Fairfax believed it was getting a good deal from a motivated seller and was content to own that much. Fairfax’s stake has grown since as Ridley, Inc. has repurchased its shares. Ridley, Inc. has been a good investment for Fairfax. The purchase price on a deal was $8.50. Shares have appreciated almost 50% since and the company has paid $3.50 per share in dividends. As usual, great write-up. Congrats on starting the new venture. I was curious to know how you were thinking about the pension obligations? Looks like the unfunded liability is around $17MM, and the assumed rate of return of plan assets is 8%, which one could argue is on the high side. It’s down from 9% in 2011, which partially caused a spike in the PO in 2012 (from 10MM to 17MM). The stock still looks cheap if you simply add the PO to EV calculations, but if that $17MM grows, it could get pretty material to valuation. I agree that the pension return assumption is high. No higher than most companies, but I think it’s pretty unlikely that most companies will earn 8% on their pension assets in this yield environment. But let’s not forget the other side of the equation: the discount rate on pension liabilities. As interest rates increase, the present value of the pension obligation will decline. If the net obligation were larger, I would be more concerned. It does represent a risk on the margins, but I an not worried by it at the moment. I did buy some of the Australian Ridley. Market cap is A$ 250MM against free cash about A$ 20 MM/year (the last two years look better because of working capital changes including stretching their A/P payments). Volume growth over the last 5 years is about nil but it has grown with some recent rendering acquisitions. The company seems to be reorganizing and getting more aggressive management. After abandoning their salt operations they retained 2,300 and 1,100 acres bracketing Geelong, an evidently growing town 35 miles west of Melbourne plus 750 acres near Adelaide. The land is seaside. Some of it should be getting zoned commercial near a regional airport. The 4,000 acres if worth A$ 25,000/acre would have a value of about A$ 100 MM, so the land is worth a substantial fraction of its current market. A TIAA affiliate, Insitor Holdings, bought 20 % of the stock from Guiness Peat this year. Unless Australia blows up it should work out.